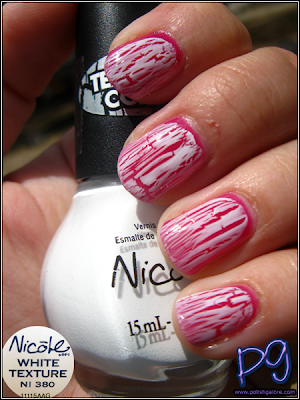 Call it Texture, call it Crackle, call it Shatter, or call it Grafitti - crackling top coats are all the rage for 2011. Nicole by OPI announced in late May that they would be throwing their hat into the ring with 6 colors. Nothing new to the game - still the same kind like OPI... the one down side is that while Nicole by OPI changed to their new "Perfect Stroke" brush back in January, there are still some issues with getting all their bottles with the same new brush. 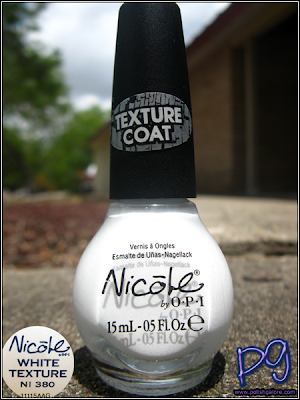 That was the case for most of my Texture collection (confirmed with the Nicole by OPI press relations representative). I decided to use my existing (and botched) manicure from yesterday with OPI Houston We Have A Purple, and just add one coat of White Texture. I topped it with OPI Top Coat. 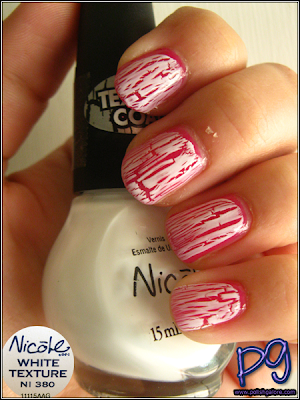 One good thing about texture/shatter/crackle is that it can hide a bad manicure. 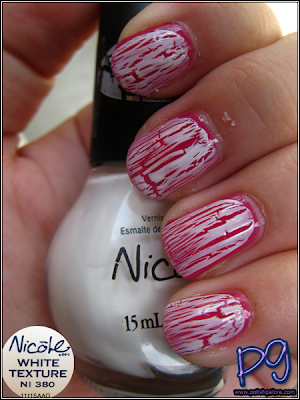 I don't like that this white isn't as crisp as OPI White Shatter but it still works. Part of it, for me, was having that thin brush instead of the "perfect stroke." By accident, I caught a picture with natural lighting. Pretty stuff! Here it is in the shade - still nothing new. And finally indoors with the flash. Not bad, not great, not unique, not terrible. 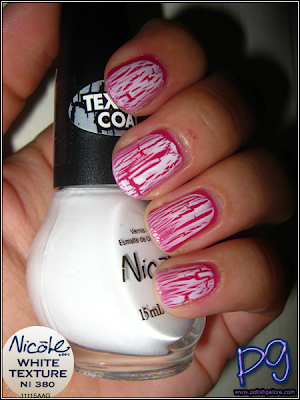 I will, however, stick with my OPI White Shatter for my white crackle/shatter/texture needs.